Hey you....don't watch that, watch this. ”Hey you, don’t watch that, watch this! Ladies and gentleman it’s…COMPLETE MADNESS. The UK’s No.1 tribute to the nutty boys! Complete Madness were formed in 1994 out of a band called ‘Beat The System’ which itself was born in 1989 with original members Mark Keegan and Derek Wood who are still with Complete Madness today, below are 2 links of Complete Madness as “beat the system” please feel free to click and watch Complete Madness in the early days. 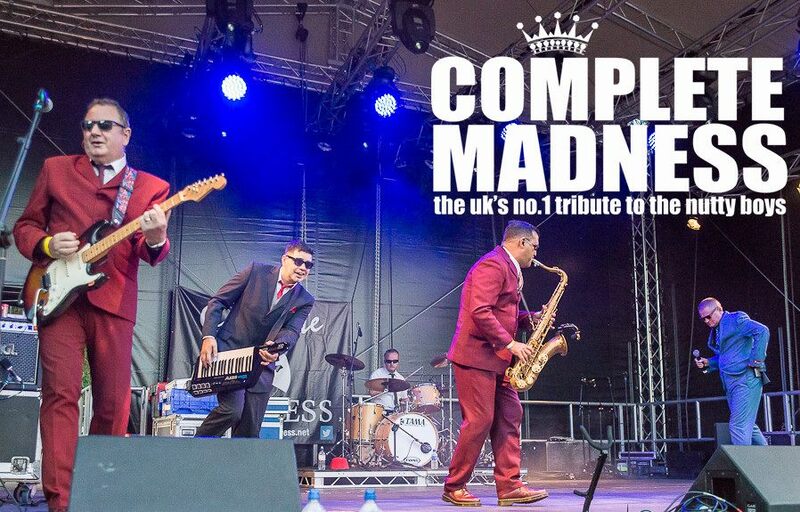 In 1994 with the ever-changing set becoming more Ska influenced they decided to change the name of the band from ‘Beat The System’ to ‘Complete Madness’. As well as a name change they also added Saxophonist and Pianist player Chris Halford to the line up and then in 1998 Keyboard/Organist Chris Collier also joined the band. It was at this point the band really began to become the band that it is today. Complete Madness also perform high profile theatre shows, performing over 60 theatres over the last few years. EARLY BIRD TICKETS (limited) £10.50 ea. Tier 2 tickets (limited) £12.50 ea.